Beauty giant L'Oreal has unveiled a smart hairbrush packed with sensors to help consumers improve their brushing technique. The Hair Coach, which will retail at just under $200 (£160), contains a microphone, gyroscope and accelerometer among other sensors. It also vibrates if you brush too hard. The brush is one of a handful of new beauty gadgets that have been announced at this year's CES tech show in Las Vegas. The brush's in-built microphone records the sounds of breaking hair. The firm says the other sensors are used to build up a profile of the way the owner looks after their hair. The brush then shares the data via wi-fi or Bluetooth to an app. The software uses the information to assess hair quality and monitor the effects of different routines - as well as recommending products. "You'd be surprised by how many women around the world are concerned about hair breakage," Guive Balooch, global vice president of L'Oreals' research and innovation technology incubator told the BBC. "One of the biggest challenges when brushing your hair is making sure you don't brush too hard and break the fibres. "That can lead to damage of hair that doesn't look good for consumers." "I am sure there are people who care about their hair quality that much - if you think that a good hair straightener costs around $90, $200 does not seem that bad," said tech analyst Caroline Milanesi of Creative Strategies. "That said, I feel we will have a lot of things that companies will add sensors to just because they can." 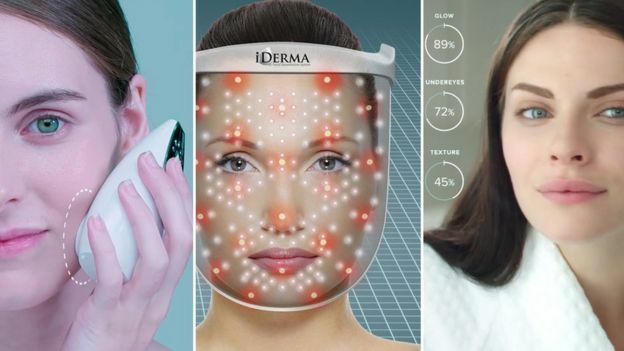 Health and beauty tech is generally acknowledged as an as-yet unproven gadget category, but many brands are now developing devices with the hope of snagging an early corner of the market. L'Oreal's Hair Coach has been developed over the last 18 months as a partnership between its brand Kerastase and Withings, which is owned by former smartphone maker Nokia. The brush is battery-powered with disposable batteries and has no charging port. "There is limited real estate on the bathroom in terms of charging stations," said Mr Balooch. He added that the device is water resistant but not fully waterproof and will be marketed as a luxury product when it launches later this year.